The first calendar software I used is the one in Palm Desktop which sync with my Palm Tungsten T5. There are a few times I have to hard reset my T5 which is equivalent to format the primary hard disk of a PC and reinstall the OS. The backup calendar information in Palm Desktop always save the day. I am a Google fan and therefore when I discover Google Calendar, I try to search for a way to sync my Palm Desktop calendar with Google Calendar. Since I can not find any freeware that works, I quit the search. 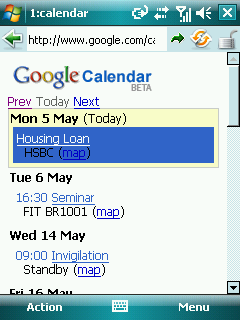 Google Calendar Sync: Getting Started and you will find the download link to the program 'Google Calendar Sync'. The program stays in the Windows taskbar and it will sync with Google Calendar automatically based on the time set or you can force it to sync immediately by right-click and click on 'Sync'. When you installed 'Google Calendar Sync', a shortcut will be placed in 'Startup' so that it will be automatically started with Windows. For me, I deleted the shortcut as I prefer to run 'Google Calendar Sync' manually every time I add some entries into my Outlook Calendar. Now Google Calendar will serve as another backup of my calendar. One scenario that I think it will be very useful is when I am away from my desktop and my phone battery is dead, I can still check my calendar if I found a Cyber Cafe nearby.